2. Select your Airport Base Station. Some users have multiple Airport Base Stations, select the one you wish to configure. 3. Enter the configuration menu for the Airport Base Station. 8. Ensure that your AirPort is not in Bridge mode. 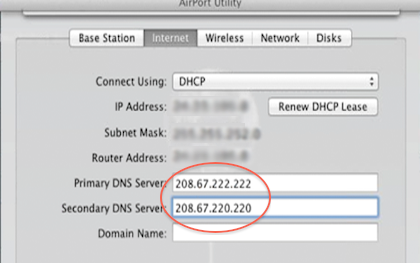 Your OpenDNS configuration will not work if the AirPort is in Bridge Mode!